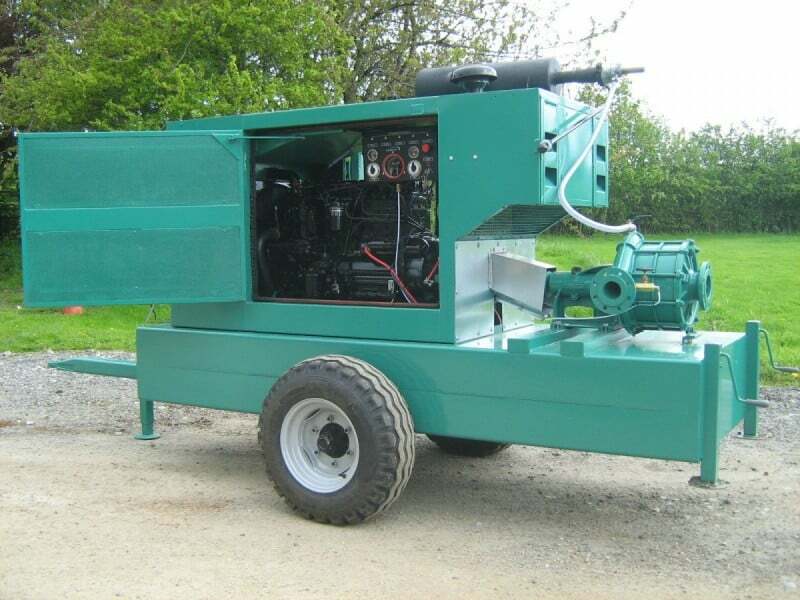 Produced in our own workshop utilising a refurbished genset acoustic enclosure and a low hours Perkins 6534 diesel engine (everything else is new), this acoustically enclosed mobile diesel engine irrigation pump unit provides excellent valve for money. 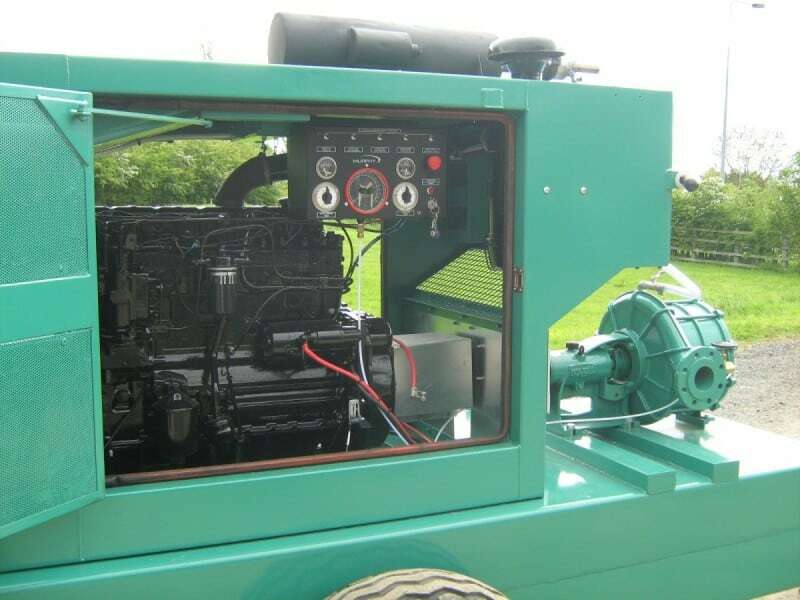 Serviced 6 cylinder, nominal 100Hp, normally aspirated diesel engine. Fan ventilated water cooled radiator. Electric start, alternator and battery. Manual hand throttle (optional automatic throttle control system available extra as required). 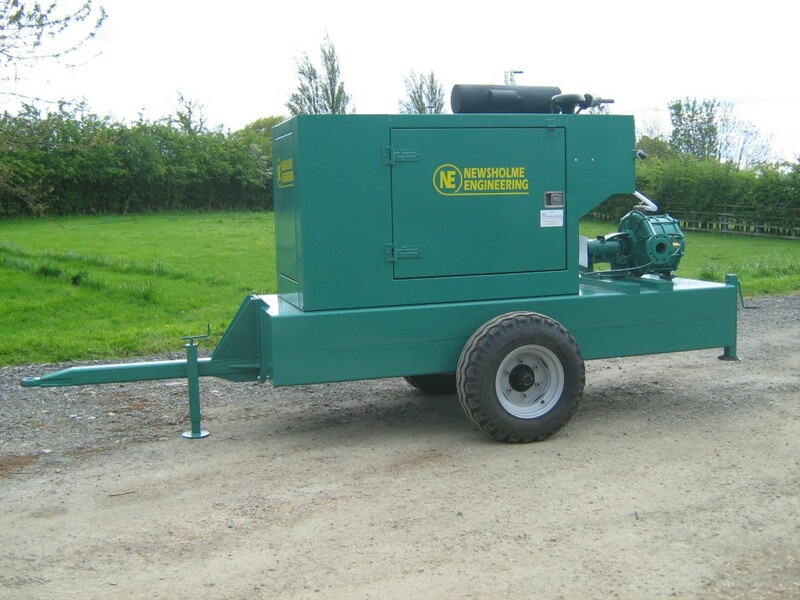 Flexibly long coupled to a new 100mm horizontal end suction, 3 stage, 80mm side delivery centrifugal pump (nominally rated 100m³/h & 12 bars at 1,800rpm). 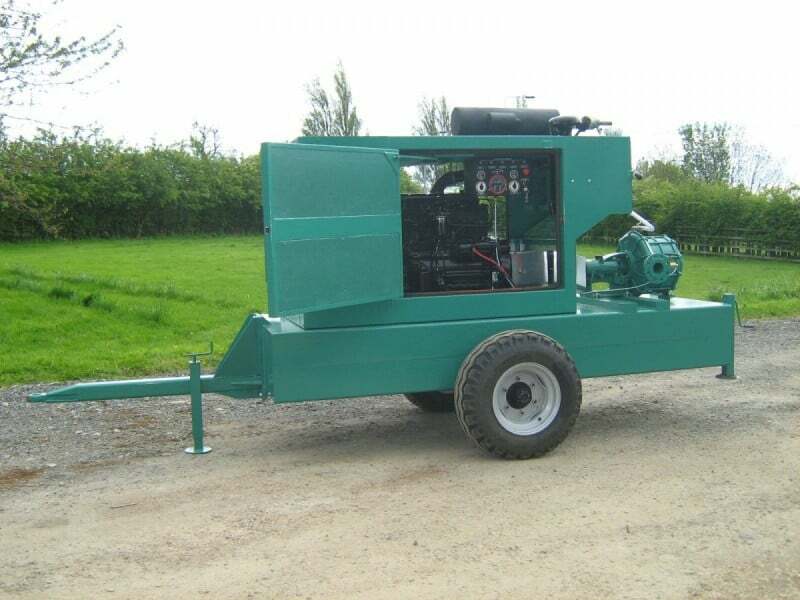 Mounted on a 1,300 litre steel fabricated tank/chassis with internal baffles and bund to contain engine fuel and oil spillage. 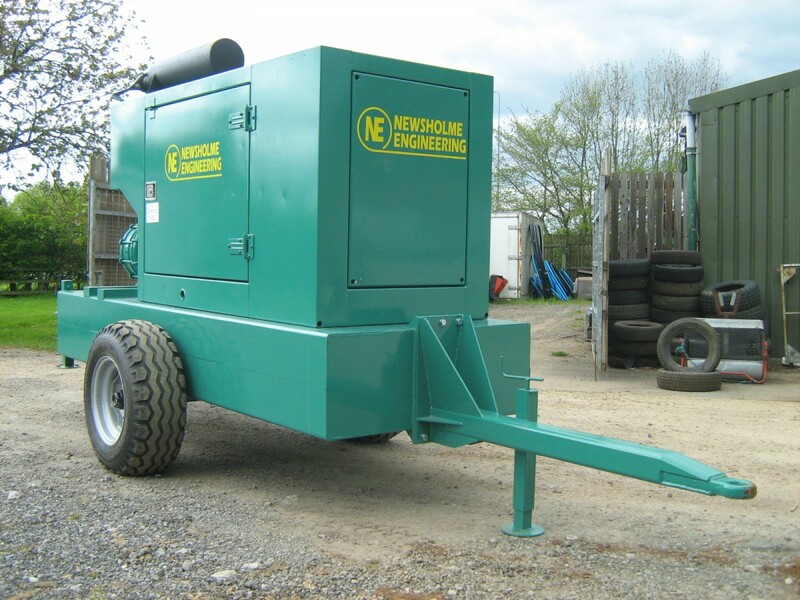 Refurbished acoustic enclosure of engine with lockable access doors and keys to pass. Locking fuel filler cap inside the enclosure. Twin stub axle wheels with 10.0/75×15.3 tyres. 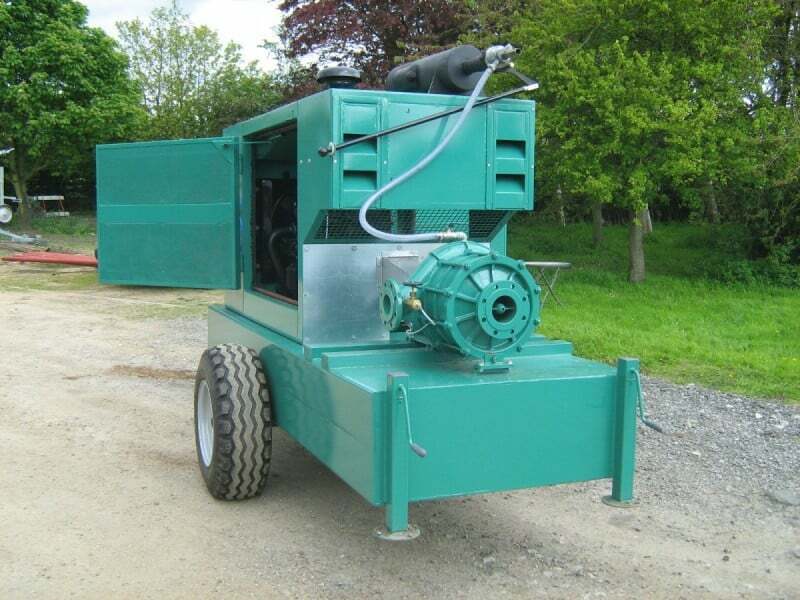 Removable drawbar with towing eye and mechanical screw jack. Twin rear mechanical screw jacks. Murphy B0188 (33.400.689) diagnostic control panel, pulsation damper and fuel solenoid provides automatic monitoring, shutdown and first out indication in the event of high engine coolant temperature, low oil pressure, high/low irrigation pump delivery pressure and adjustable 24 hour timer expired, with key start switch, no charge warning lamp, fuse holder and adjustable timer to over-ride low pressures/low flow on starting. Additional suction and delivery fittings, including hand priming system and flow switch etc. are available extra as required.